The revamped DVR will go on sale on December 12, and come with a $250 sticker price. However, Newegg is offering customers a pre-order price of $200, suggesting that the $250 may not be set in stone. The device, coming with the model name “STV2-2US,” will have two tuners. The description on Newegg.com says that it will be able to stream up to five channels simultaneously, which is a bit funny math — but it may just mean that you can watch recordings or live video feeds on up to five devices at the same time. 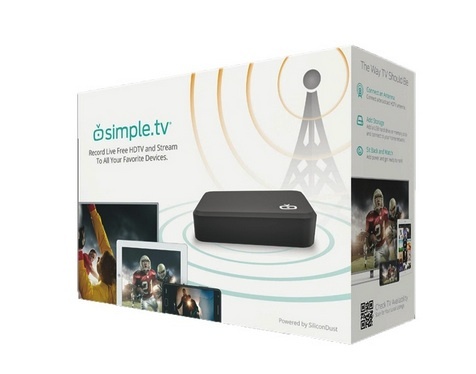 Simple.tv will make these streams available on PCs, mobile devices and Roku boxes within the home network or on the go, and the company has also said that it wants to bring its service to Chromecast and DLNA-compatible devices next. Newegg also spilled some additional details about the hardware provided by Silicondust, which is based on a Zenverge ZN200 chipset, comes with 1GB of RAM, an Ethernet port and a USB 2.0 port. A hard drive is not included, so you’ll have to buy your own external hard drive to actually record shows. Consumers will presumably also have to subscribe to Simple.tv’s EPG service. I asked Simple.tv whether the device will come with a couple of months of free service, but haven’t heard back yet. I went on ebay and bought a first generation simple.tv with lifetime subscription for $150. So if you buy that plus the dual for $250 you are only out $400 for three tuners and maybe an extra $100 for two USB hard drives. I also have a windows media center and I use plex, but I really wanted the functionality to watch live tv (sports and news) on all of my roku connected tvs in the house without having to run coax to each one, especially since the antenna signal gets weaker after splitting it and having long runs. Simple.tv works really good and almost obsoletes my media center if it wasn’t for the ease of viewing pictures and listening to music off of the media center. As of right now the UI for the roku is fairly clunky as well as it does not show a guide similar to the media center guide and it is not easy to set up shows that you want recorded. The html format does and it works easily to set up recordings. I am anxiously awaiting android support. I guess I just don’t get this product. With a PC not worth much if any more than the new Simple.TV will cost, I have a very satisfactory PVR/DVR set up and no month subscription fees. The PC runs Windows 7, Windows Media Center (WMC, and PlayOn and has a Hauppauge tuner attached. WMC has a free EPG, which I use to schedule recordings. I use PlayOn to stream these recordings to my Rokus and i-devices. (You could do the same with Plex, though I think its a little more complicated to set up.) And that’s it. If you have to buy a PC, the initial set up might be a little more than the new Simple.TV, but you’d soon make that up because you need no subscription. And if you have an old PC which could do the job, even the initial set up is cheaper. If you want TV anywhere, you’d need to add Plex to the mix, but since I don’t care about recorded TV outside my house, what I’m using now seems much cheaper. Since most cord cutters are younger adults (under 40 — though I’m in my mid-50s), I would think the home brewed DVR would be the way to go for most. I understand the set up issues could be a problem for many and the additional power drain as also being an issue. As to working with multiple devices, we can watch recordings on our PC (we have no Macs), Rokus, iPads, iPhones, etc.. The big issue to me is the ongoing subscription for a program guide, something which could be implemented for free as Windows Media Center does. I think the same is true for BeyondTV. Why am I having to pay for something which could easily be provided at no extra charge? I might be willing to pay $1/month for the convenience, but not more than $100/year. And the argument that charging an outrageous subscription for something that is probably free for Simple.TV because their margins on the hardware are thin doesn’t convince me. I need to have DVR functionality, and from what I’ve read, PlayOn/PlayLater look good, but only do 480p! depends in the area (zip code). cost but the service subscription is crap! You don’t need to subscribe to their service, but you are limited to recording what is currently playing and no ability to setup “season passes”. When will a DVR service come out that doesn’t require a dang monthly subscription fee? And no, TiVo’s overpriced $500 option doesn’t count. There’s a big demand out there for such a solution, when will they figure out a monthly bill is the reason people are cutting the cord?! The problem is that hardware is a tough business with very thin margins, especially if you go retail. So it’s hard fro companies in this space to make money with anything but a service fee. Plus, they all have to pay to get EPG data. Somehow, VCRs were a commercial success. I don’t need EPG, I just want a way to program a device to record shows on a specific channel, at a specific time, and I don’t want to use tapes anymore. I have the iView OTA DVR, available off Amazon for $40. No frills with basic EPG. Unlike Simple.tv, can’t stream to mobile or web however. I’ve got an iView 3500STB and have found that I can plug the hard drive into my computer and stream the video files over my network to my Rokus using MediaMall’s MyMedia. Of course it isn’t as nice as the self contained networked Simple.TV, but it costs a tenth of a second generation Simple TV with lifetime guide. Go to amazon and search for Magnavox DVR. I’ve had one of these for 3 years. It has a hard drive and works like a VCR. Except it records and plays back in SD. This product is unlikely to succeed because of the monthly fee requirement. The main reason people watch over the air TV is because it’s free. I think $5 a month is a great deal,especially when you get the tv guide service online.I have simple.tv and it works well for me. I do think that simple.tv staff should concentrate more on customer service and quality than producing new products.The happier that customers are,the more they will spread the word. I hope the Simple.TV staff polish up the SimpleTV interface on the new box, I just dusted off my original Simple.TV device and plugged it back into my network for some over the air recordings. The configuration to set it up is not the best on the orignal box, you have be very patient, But when it works, it works great with both the Roku and iPad, Plus it even works from remote locations. It’s a perfect device for people that have cut the cord and just need local news and local stations. With my little 2 bay roof antenna My Simple.TV device is able to pick up about 22 digital channels out of the 24 I can get from my area. So not bad at all.